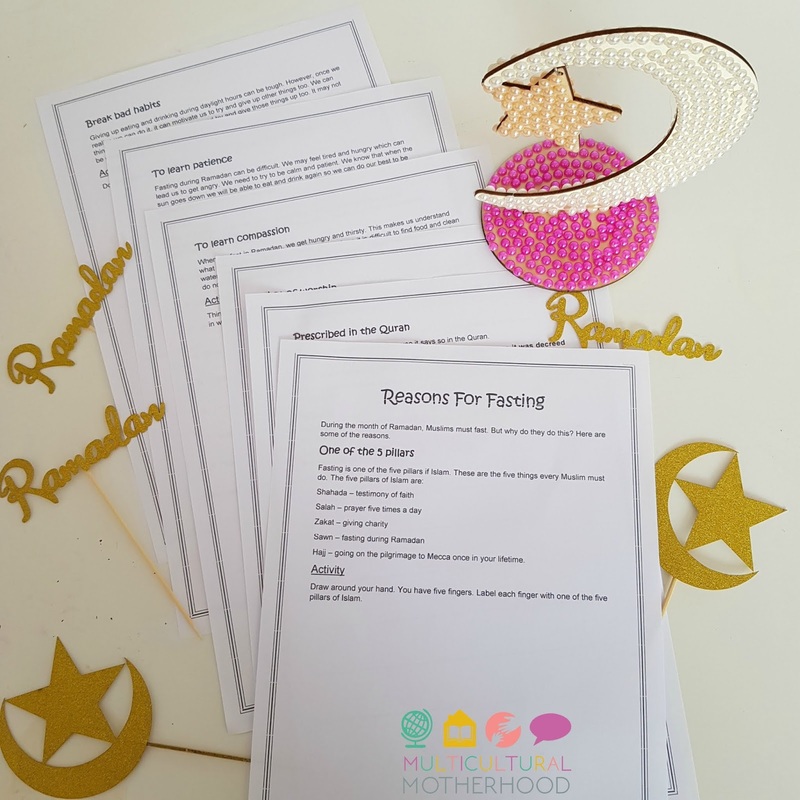 Reasons For Fasting in Ramadan - Activities For Kids + Free Printables! Before I became Muslim, I wondered why Muslims fast during Ramadan. I wanted to know what the point of it was and why Muslims would want to abstain from food and drink during daylight hours for a whole month. I must admit, it seemed like a pretty crazy thing to do! So, before I became Muslim, I just had to find this out for myself. Now I know the reasons, I need to get these across to my children as I know, like me, they will want to know why our religion prescribes us to do this. We all know it is an obligation, but why is this so? What are the reasons behind it and what are the benefits for us? 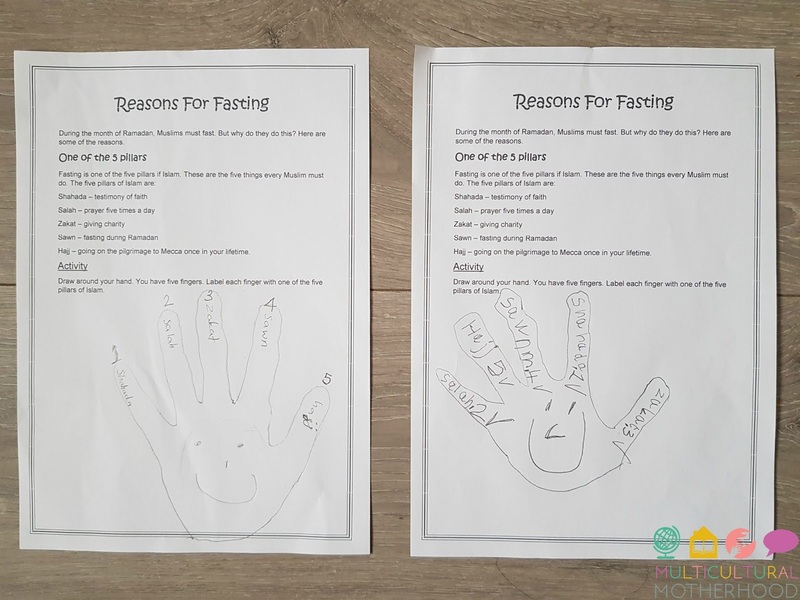 To help to teach my children about the reasons for fasting in Ramadan, I decided to do some activities with them to help them understand. I also created some printables to help explain these concepts. 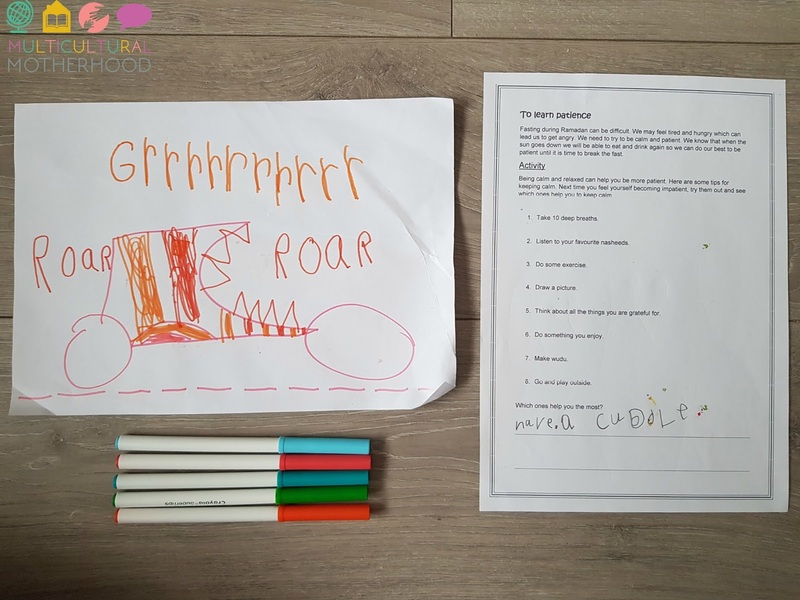 The printables include further activities for your children. 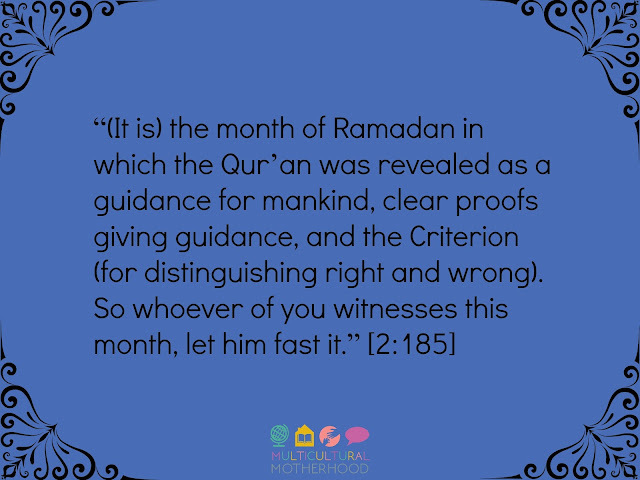 Firstly, we fast in Ramadan as it is one of the five pillars of Islam. These are the fundamental, obligatory things that all Muslims must do. The five pillars are Shahada (testimony of faith), prayer five times a day, zakat (charity), fasting in Ramadan and going on the Hajj pilgrimage once in your lifetime. 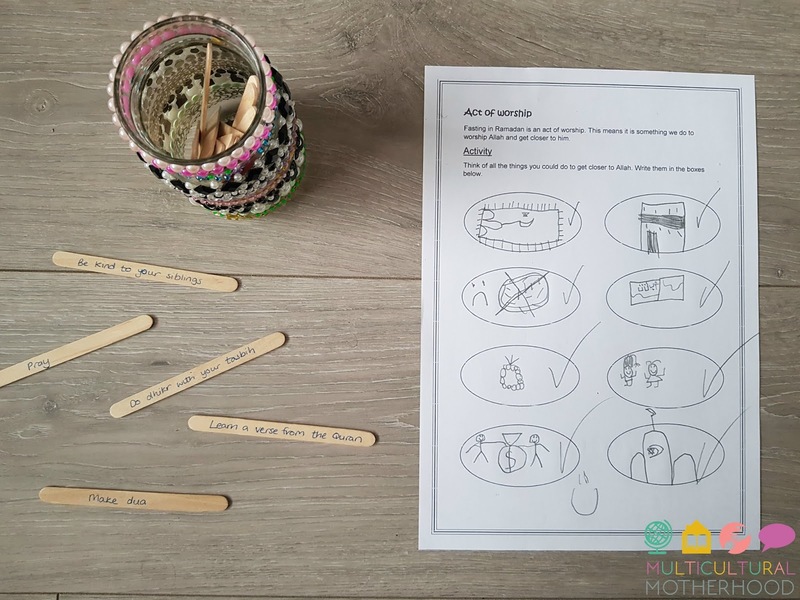 To help them learn about the five pillars we filled out the printable and did a simple craft. We created the five pillars using cardboard tubes. You can see the tutorial for this HERE. Secondly, fasting during Ramadan is something that we are told about in the Quran. I read this verse to the children and explained what it meant. 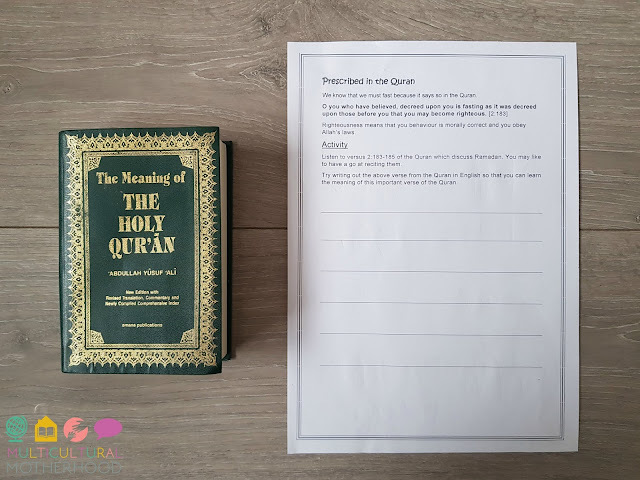 Then we listened to the verse recited in Arabic and the children practised reciting it. My eldest, who is eight years old and loves writing, wrote the verse out. Fasting is an act of worship. I explained to the children that an act of worship is something which you do to get closer to Allah. I asked the children what they thought they could do to get closer to Allah and they drew pictures of the acts on the printable. Then we created some 'Acts of Worship' jars. 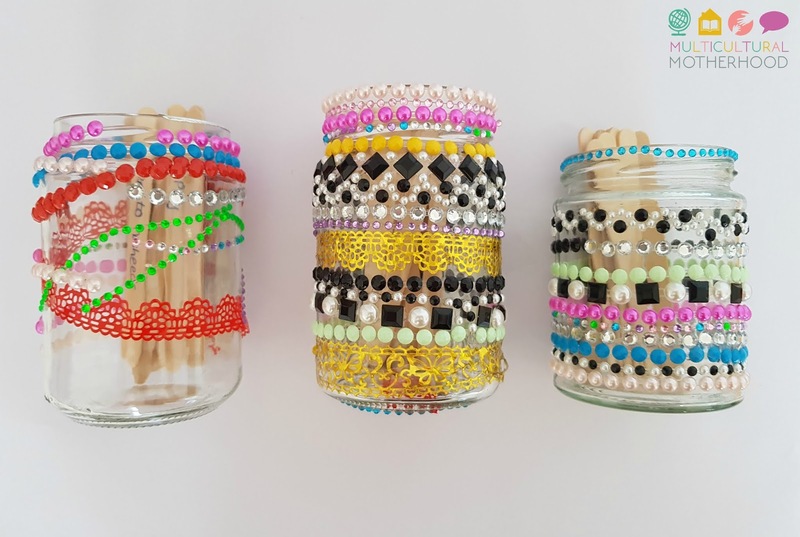 To make the 'Acts of Worship' jar we simply decorated jars and wrote acts of worship on lolly sticks and placed these inside the jars. You can see the full tutorial for the Islamic acts of worship jars HERE. Another reason for fasting is to teach us how to be compassionate. We learn what it feels like to be starving. How it must feel for the people who are unable to buy food to eat or find clean water to drink. In the UK, and a lot of western countries, it is hard to imagine what it must be like for those in other parts of the world where food and drink is scarce. By fasting, we gain a little insight into what it must be like for those people. We experience hunger and thirst throughout the day but we are able to eat and drink as soon as the sun begins to set. How lucky we are to have the provisions to be able to do this! Others are not so lucky unfortunately. I spoke to the children about how we must have compassion for others. How we must think of them and be kind to them. We discussed what we could do to help those in need. The children agreed that we should give money to charity. 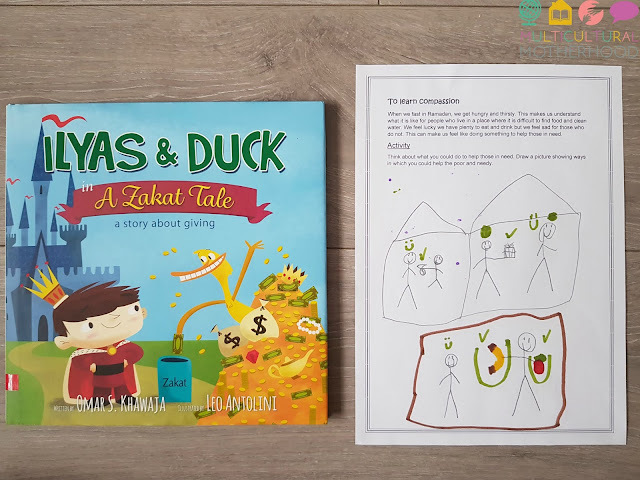 We read the 'Ilyas and Duck' book 'A Zakat's Tale', a wonderful story about how it is important to give money to charity. You can read a review of it HERE. We also talked about other ways we could help the poor and needy and drew pictures on the printable. I told the children I used to make food for the homeless. The children thought feeding the homeless sounded like a wonderful idea so I am going to look into ways we can start doing this again. Abstaining from food and drink can affect your mood as well as your patience. You may keep your eye on the clock wishing the hours away and become agitated at the slightest thing. However, we should remain calm and collected and practise patience. Fasting may cause us to face negative emotions but teaches us to turn these into positive ones through practising patience. I asked the children to think of times when they were impatient. Then we discussed ways they could be more patient. This is what they came up with. Giving up food and drink during day light hours can be really difficult! It can push your willpower to the limit! However, it can be done. With each day that you fast, you realise you can do it if you are determined enough. This makes you begin to think about other things you could give up. 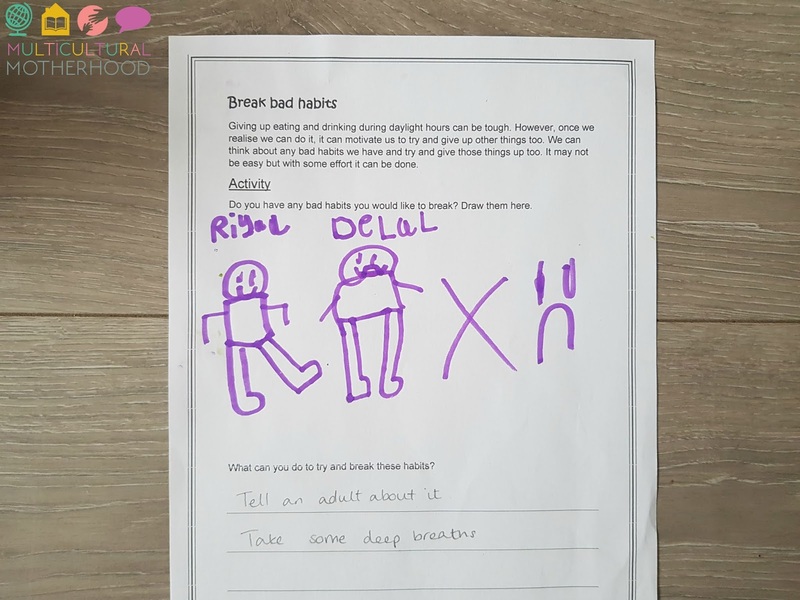 Do you have any bad habits you would like to break? Perhaps your ability to fast will give you the motivation you need to give up one of your bad habits. I asked the children if there were any bad habits they would like to give up. This is what R came up with. Then I asked them what they think would help them to calm down and remain patient. R said a cuddle from me would make him calm down. I hope this has given you some good ideas of ways to teach your children about the importance of Ramadan and the reasons Muslims must fast. To get your copy of the FREE 'Reasons For Fasting' printables, click the link below and they will be sent to your email. 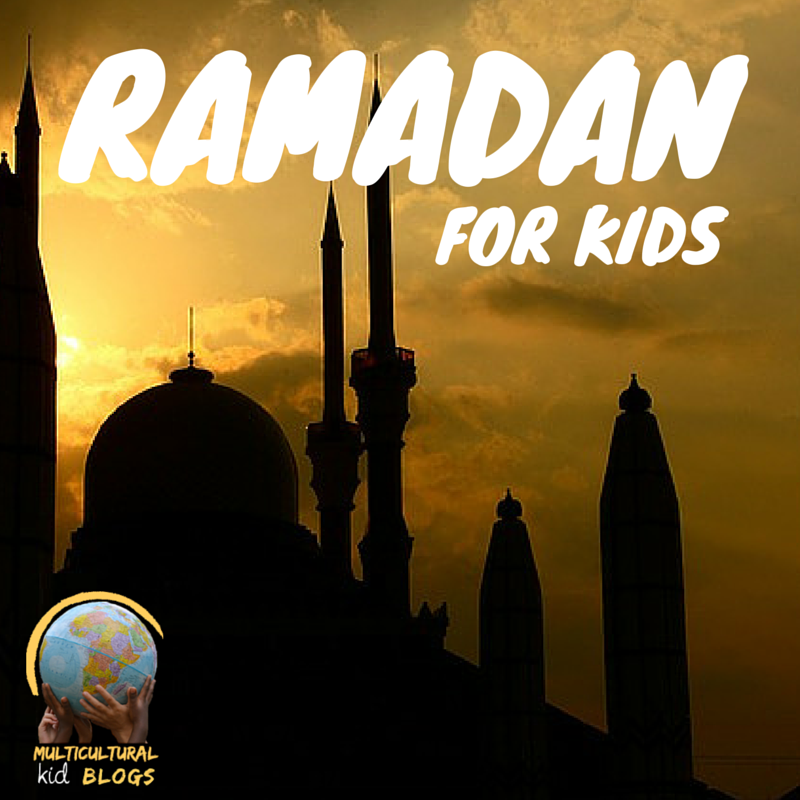 Multicultural Kid Blogs is proud to be hosting its fourth annual Ramadan & Eid for Kids blog hop, where bloggers come together to share ideas for teaching kids about and honoring Ramadan & Eid. Don't forget to check out our blog hops from last year, 2016 and 2015. Be sure to follow our Ramadan & Eid boards on Pinterest for even more ideas and link up your own posts below!